Gusty wind wrinkled the face of Oregon’s Deschutes River, making a delicate dry-fly presentation all but impossible. To combat the conditions, I added a sink-tip splice, shortened the leader to 3 feet, and tied on a beadhead streamer. Wading along the middle Deschutes, casting low across the surface, I was able to place it on target, and a hefty redband trout in a rocky tailout took the bait. The wide-gap hook held, and following a spirited tussle, I guided the big trout into a long-handled net. As a blast of wind nearly lifted the cap off my head, the thought came that this fish simply could not have been caught with a different presentation, but she had opened wide for the beefy streamer. Log-on to fly shop websites in the fall of the year, and you will see the resurgence of streamer patterns on the respective fly charts. Conditions may force the use of a weighted streamer, as they did that day on the Deschutes, but the seasonal consideration for streamers can be just as strong. Without weighted streamers, I know the fly-fishing that early fall day on the Deschutes would have been awfully dull, and I had traveled a long, long way to tangle with those storied trout. The late afternoon hatches presented wonderful fishing, but I started and ended most days with a flashy streamer pattern. 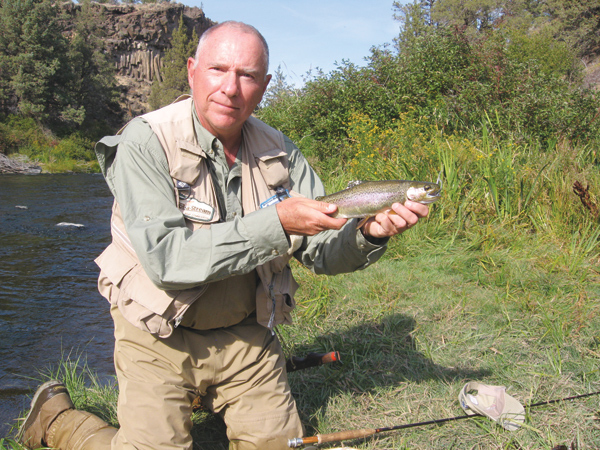 The Deschutes’ redband is a sub-species of the “regular rainbow,” if I may use that term. However, there’s no real distinction behaviorally nor in terms of preferred habitat. In appearance, the distinguishing marks are a wider and brighter stripe, white or lighter-tipped fins, rounder spots, and a tendency to keep parr marks later in life. Redbands roam the West; the Great Basin redband is the one found in Oregon. On this trip, I believe I caught both redbands and colorful rainbows, not being able to tell one from the other. Indeed, the redband is losing its genetic identity, what with the intermingling of stocked rainbows. 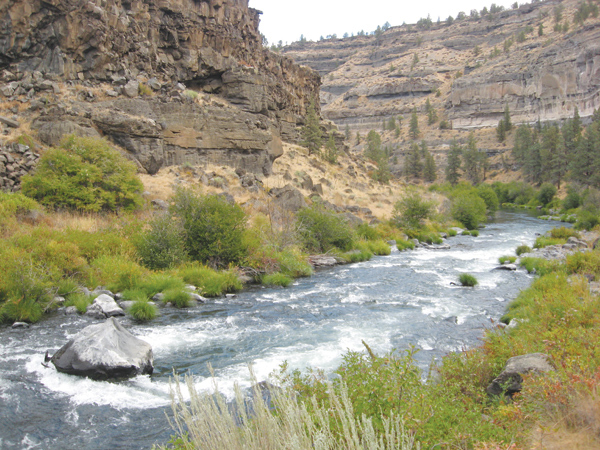 I worked mostly fast sections of the Deschutes—tailouts, rock riffles and channels—places I know rainbows like to hold. In large rivers with both brown trout and rainbows, it seems the brown trout often hug shore while the rainbows take the more challenging lies farther out from the bank. Deschutes’ redbands (and rainbows) act the same way. Such fishing requires a streamer that quickly gets down to the fish, and I had to forego some renowned feather-made streamers that do not sink fast enough nor ride low enough in such strong current. Lesser-known streamers tied with synthetic materials catch more fish in such water. I may use feather-wing streamers in water down to 3 or 4 feet, but for the deeper and faster flows, I prefer streamers tied with synthetics, such as Wing N’Flash and Polar Fibre. Too, the addition of a beadhead or conehead not only provides casting weight for windy days, the weight also helps to keep a fly riding low in current. Some like to tie streamers with dumbbell eyes—two lead eyes in a configuration like a dumbbell—but casting these bulky, overweight flies can be a good way to give yourself a pierced ear. Yes, they can be great fish-catchers in the faster flows, acting more like jigs than streamers, but they cast like wet rags. I find the rounded face of a tungsten beadhead or the bullet shape of a conehead easier and less tiring to toss. Wing N’Flash is a tinsel-like material with long, flexible strands. A material marketed as Lite Brit appears about the same, but with chopped pieces of tinsel made for dubbing. Wing N’Flash is made by Hedron and sold by Wapsi. I like to use two colors, gold on top and pearl on the bottom. This combination was shown me by the owner of a fly shop n Fairfield, Maine, a shop that has since shut its doors. The man simply called it a Beadhead Minnow. I have boldly renamed the pattern the Fairfield Fly, in honor of its creator. The sinewy, light-bending quality will take trout and salmon from Maine to Oregon. 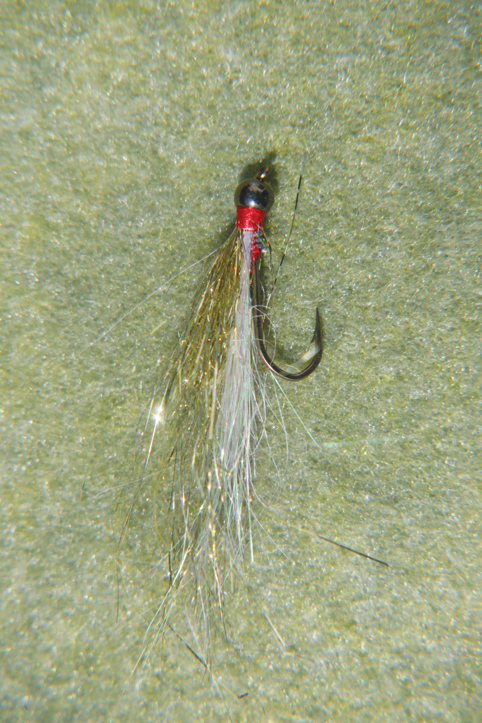 The tying of the Fairfield Fly is so unabashedly simple as to hardly require instruction. After adding the tungsten bead and some additional lead wraps behind the bead, simple loop in the white belly material and then the gold dorsal material on top, puffing the two to give the fly a broader appearance. Polar Fibre, sold by Orvis, is bulkier and stiffer than Wing N’ Flash. It reminds me of the guard hairs on my Brittany. As it makes a bulkier fly, I prefer a conehead weight on the front of Polar Fibre. The conehead has a narrow nose, but the rear is open and flat. I push the Polar Fibre up behind this open cone, making either a neat, concealed head or a wider, water-pushing collar. I tie various combinations with Polar Fibre—brown, tan, grey and white to imitate fingerling brown trout, dace and sculpin; olive, pink and white to make a devastating rainbow fingerling imitation. Underwater, Polar Fibre has more luster than the Wing N’Flash, and trout will show a preference for one or the other. Wing N’Flash can be deadly night fishing under a bright moon. But the duller Polar Fibre “shines” on darker nights. In any case, it pays to bring streamers tied with both materials. When fishing streamers made with these synthetics, I use a floating fly line with a 5-foot add-on sink-tip. Some prefer a full sink-tip line, which has a weighted tip as part of the floating line, but I like add-ons that are connected with loop-to-loop knots. Again, it may be only personal preference, but I find these easier to cast and to work than the manufactured sink-tip lines, which tend to “hinge” underwater. For the line-to-fly connection, I like a 3-foot hank of fluorocarbon tippet, a common practice with manufactured sink-tips, as well. To help achieve a good running depth, I mend, or curve, the line upstream during the forward cast. Fly anglers refer to this as a reach cast or a reach mend. To achieve it, the caster lifts and pulls the rod back upstream while the line is leveling and shooting out from the rod tip. This creates an upstream curve or bend in the line. When the weighted streamer hits the surface, it sinks on the slack line. If an aerial mend were not made, the current would immediately pull the line tight, and the fly would not sink as readily. As the fly works through deep current, upstream mends should be made to keep it deep. A tight line will only lift it off bottom, a move that should be saved for when the fly is arcing back across the flow. Then, a fly rising in a tailout or at the end of a chute can be dynamite. Another good trick is to leave the weighted streamer hanging in the current directly downstream. After the fly has arced across the flow, hold the rod parallel to the surface with the rod tip pointed downstream at a slight angle to either side. The idea is to keep the fly swimming off bottom but in the same spot; I usually count to 15 before resuming the retrieve. Often, a trout that has followed across the current will attack, or else a trout that has been finning on the edge of the current will rush over and grab the hanging fly. Part of the tactic here is to have a “hinge” or slight dip of slack from the rod tip to the fly line on the water. This gives the trout some leeway to grab the fly and turn before feeling the line. A straight, tight line may result in a short snap by the trout and a missed hook-set. The amount of action imparted during the retrieve is also important. I prefer to give a weighted streamer a series of short, quick strips rather than long, lazy pulls. I also jiggle the rod tip to impart some wiggle through the line to the fly. I think of this as imitating a minnow or fry that is scared and bolting from an approaching fish. This little trick often triggers reaction strikes. Be sure to present the weighted streamer to every rock and pocket within reach. With feet firmly planted, start with short casts and then lengthen the line until you reach all of the places where a trout might hold. You want the streamer working through “fresh” water following each cast. Yes, I love it when the hatch brings trout to the surface, but for all of those other times, a weighted, synthetic streamer can be the way to go.